The MFA Film Program is proud to present a retrospective of award-winning director Julian Schnabel’s first three films, May 2-8. Presented in conjunction with this year ' s The School of the Museum of Fine Arts , Boston Medal Award ceremony and gala dinner, a fundraiser for student scholarships. 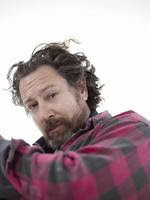 On Monday, May 12, 2008 , Julian Schnabel will be present to accept his award and guests of this event will have the distinction of being one of the first to view his most recent directorial project, Berlin , before its release to the general public. Born in Brooklyn and educated in Texas , Julian Schnabel rose to prominence as a painter in the 1980s after his first exhibition at the Mary Boone Gallery in New York City . Since then, Schnabel’s work, including his signature large-scale neo-expressionistic and collage works, has been exhibited all over the world. His paintings, sculptures and works on paper have been the subject of retrospective exhibitions at the Centre Georges Pompidou, Paris; The Whitechapel Gallery, London; The Stedelijk Museum, Amsterdam; The Tate Gallery, London; and The Whitney Museum of American Art in New York. Schnabel lives with his wife Olatz Lopez Garmendia, who plays Marie in The Diving Bell And The Butterfly, and their family in New York City and Montauk, New York , and San Sebastian , Spain . Schnabel’s assertion that he’s "aiming at an emotional state, a state that people can literally walk into and be engulfed by" is equally applicable to his emotionally energetic paintings and his vividly beautiful films. Tickets: Members, seniors and students $8; general admission $9. Discount matinee prices (weekday until 5 pm ; weekends until 12:30 pm ) are $6, $7. To purchase please call the box office at 617-369-3687 or online at http://www.mfa.org/film. For more information about the Medal Award dinner or to purchase tickets for this event, please visit www.smfa.edu/ medalaward or call 617-369-3591. Basquiat (1996, 108 mn.). in 1981, a 19-year-old graffiti artist by the name of Jean-Michel Basquiat took the New York art world by storm, becoming one of the most successful and controversial of the period. By 1988, he was dead at the age of 27. Artist Julian Schnabel makes his debut as a writer and director with Basquiat, lending an insider’s astuteness to the world of art and to an individual once described in The New York Times as “the art world’s closest equivalent to James Dean.” Tony and Golden Globe winner Jeffery Wright makes his starring debut as the ill-fated artist. Schnabel has enlisted a fascinating cast which includes David Bowie as Andy Warhol and Parker Posey as art dealer Mary Boone. Other making cameo appearances include Christopher Walken, Willem Dafoe, Paul Bartel, Courtney Love and Tatum O’Neal. Before Night Falls (2000, 133 min.). Winner of the Grand Jury Prize at the 2000 Venice Film Festival, Before Night Falls is a richly imagined journey into the life and writings of the brilliant Cuban author and exile Reinaldo Arenas. Directed and co-written by Julian Schnabel the film stars academy award winner Javier Bardem, whose eloquent, complex performance as Arenas earned him the 2000 Venice Film Festival ' s Volpi Cup for Best Actor. Before Night Falls is a portrait of a man whose search for freedom - artistic, political, sexual - defied poverty, censorship, persecution, exile and death. Like Arenas ' work, Before Night Falls combines passages of transporting imagination with urgent realism; in so doing, it embodies the creative ethos to which Arenas dedicated himself: transforming experience into unfettered expression. The Diving Bell and the Butterfly (Le Scaphandre et le Papillon) (2007, 112 min.). Celebrated painter and filmmaker Julian Schnabel’s third feature finds him reaching new artistic heights with this audacious and personal biopic, based on the best-selling memoir of the same name. The film tells the remarkable tale of Jean-Dominique Bauby, the world-renowned editor of French ELLE magazine, who suffered a stroke and was paralyzed by the inexplicable "locked in" syndrome at the age of 43. Bauby’s only way of communicating with the outside world was by blinking with one eye, and after several dedicated helpers helped him to speak through this seemingly irrelevant gesture, he began to produce the words that would form his memoir. Along the way, as he swam in and out of consciousness, memories from his past swelled into the present, resulting in a cinematic experience that is at once heartbreaking and hopeful. The Diving Bell and the Butterfly is a gloriously unlocked experience, with some of the most creative uses of the camera and some of the most daring, cruel, and heartbreaking emotional explorations that have appeared in recent movies,” (The New Yorker). French with English subtitles.